Red Iron Burgers and I go a long way back. 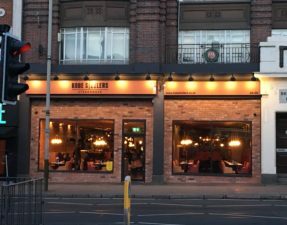 You see, it all started back in 2012 when HGAT was in it’s early days; I was young, curious, and wanting something a little different, when I heard about a gourmet burger restaurant in Uxbridge serving halal meat. It was the first of it’s kind in London, and upon the night of visiting, I was just so overwhelmed with nerves. What if Red Iron didn’t turn out to be what I was expecting? But, upon tucking in to their signature Red Iron burger, I knew something was about to change forever. It was love at first bite. Over the last couple of years, I became aware that Red Iron were planning to launch something new and exciting, and I did keep trying to have a sneak peek, to no avail. 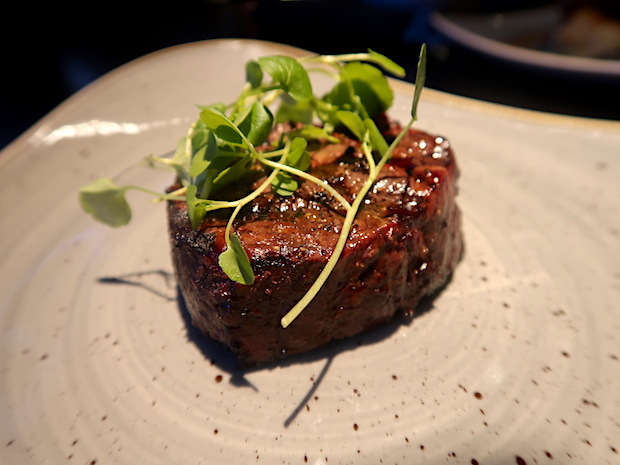 Finally, they revealed a couple of months ago that Red Iron would be extending the restaurant into a premium halal steak dining room, the Red Iron Steakhouse. Although they only opened a couple of days ago, I made sure to book a table with BW in tow, and just like that first night all those years ago, I was full of butterflies. 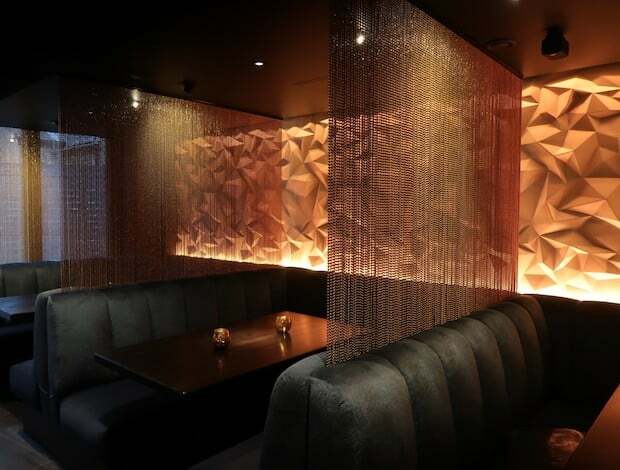 Walking in, there is a notable difference between the two dining rooms; the front of house is still hip and casual, whilst the back room boasts a more elegant and suave atmosphere. We got seated and ordered! 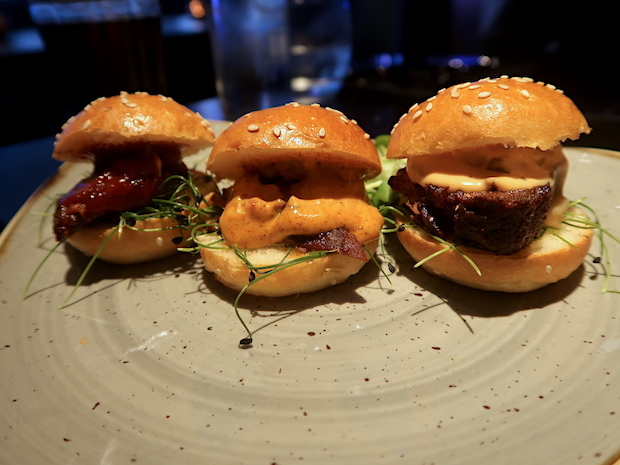 Three cute mini sliders that had been stuffed with shreds of smoked beef brisket, and served with an assortment of sauces: chipotle, bbq, and creamy house sauce. The beef itself had been smoked for over 8 hours and was incredibly soft, but I felt that there could have been more meat inside the tiny buns. 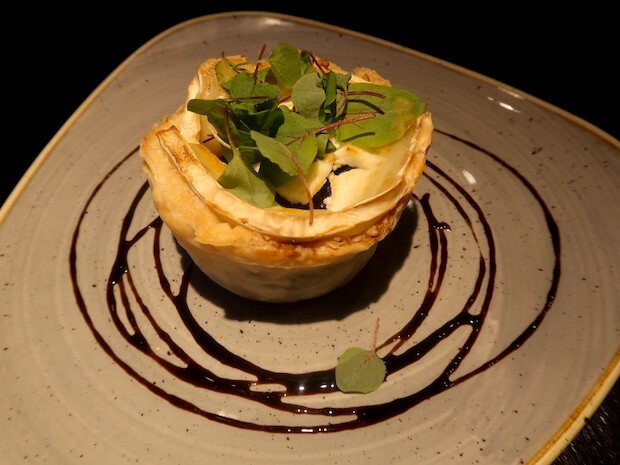 A flaky pastry that was stuffed with an abundance of creamy goat cheese and sweet caramelised red onions, and finished off with a drizzle of balsamic. 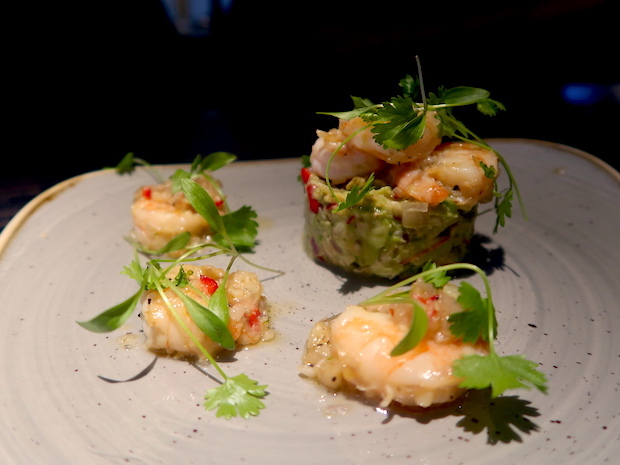 A simple, yet my favourite, starter: juicy prawns served alongside a mountain of avocado salsa. The well-cooked prawns had been topped with a garlic, shallot, and lemony dressing, which help to cut through the creamy avocado salsa that also managed to pack a sharp and spicy punch. 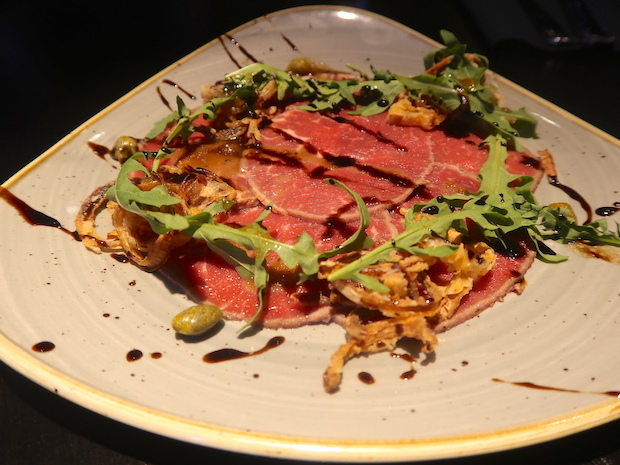 Thinly sliced, seared beef fillet that had been dressed with crispy shallots, capers, rocket, and a drizzle of balsamic, but a notable absence was the parmesan. Although the quality of the beef was fantastic, as were the individual components, I felt that the beef was missing some seasoning which would have been justified had there been a few simple shavings of salty parmesan. Although this is the leanest and most tender cut of beef, the fillet usually carries less flavour in comparison to its other beefy counterparts. 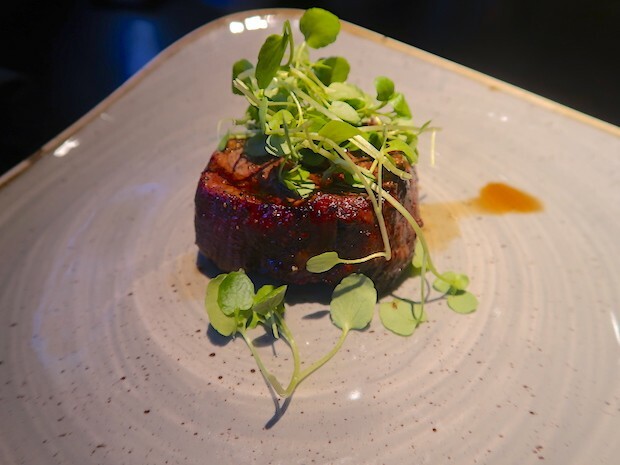 This wagyu fillet was incredibly tender and the knife gracefully glided through like cutting butter, but a sauce was essential to add a kick of flavour to the meat. Due to it’s high fat content, rib-eye is the most flavoursome (and best, in my opinion) cut of any beef. 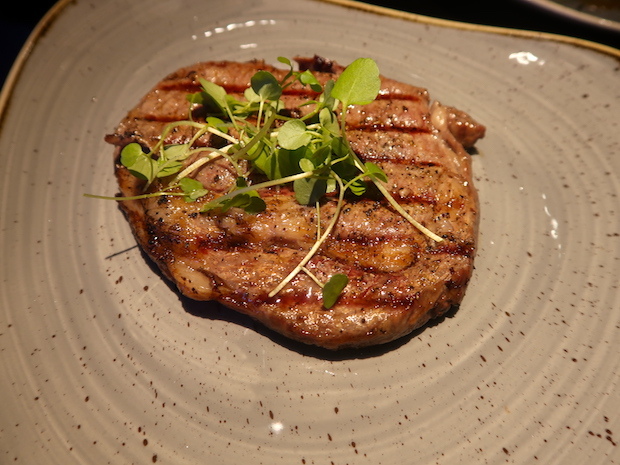 Now, imagine a wagyu rib-eye steak cooked to a perfect medium – killer! Each bite contained little deposits of fat that just burst in your mouth, and combined spectacularly well with the smokiness from the grill – a really good steak after a very long time. If you’re eyeing up the wagyu, I highly suggest you go for the rib-eye, but beware, this it not a steak for those of you who hate fat! This USDA Prime fillet surprisingly stole the show away from both the wagyu steaks, with its incredibly deep, meaty flavour. It was so good that there was no need for any of the accompanying sauces to be eaten alongside it. 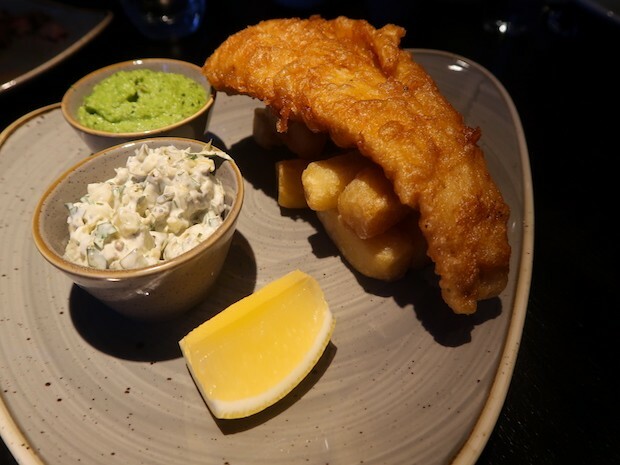 A classic dish consisting of a humongous piece of cod that had been dipped in batter and deep-fried to a rich golden colour, and served with triple cooked chips, pea and mint puree, and tartare sauce. The fish managed to maintain it’s flakiness within the crunchy exterior, and the accompanying sides were a perfectly adequate complement. Scalloped potatoes that had been cooked in a creamy white sauce; all it lacked was a nice crisp, cheesy crust along the edges. 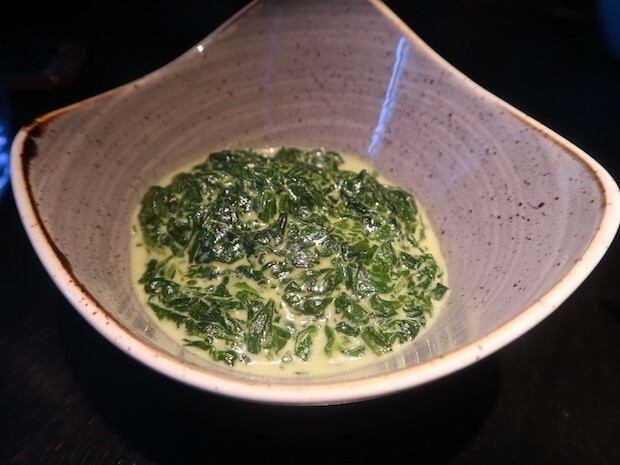 The wilted spinach in a creamy sauce had been cooked well but a touch of seasoning would have finished this off quite nicely. 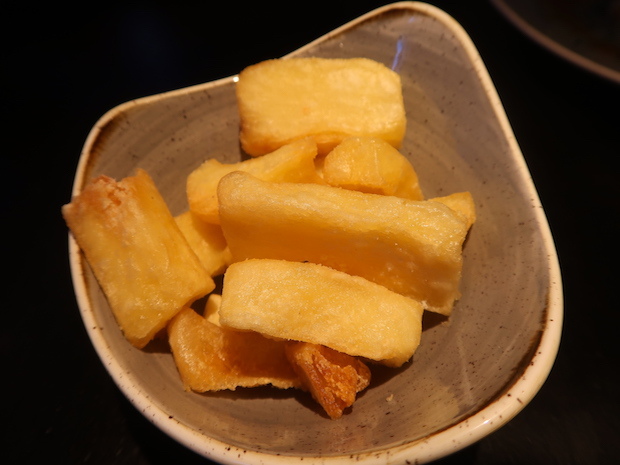 Huge and crunchy chips that had been cooked, not once, not twice, but three times! They were intensely fluffy on the inside with a lovely golden crisp on the outside. 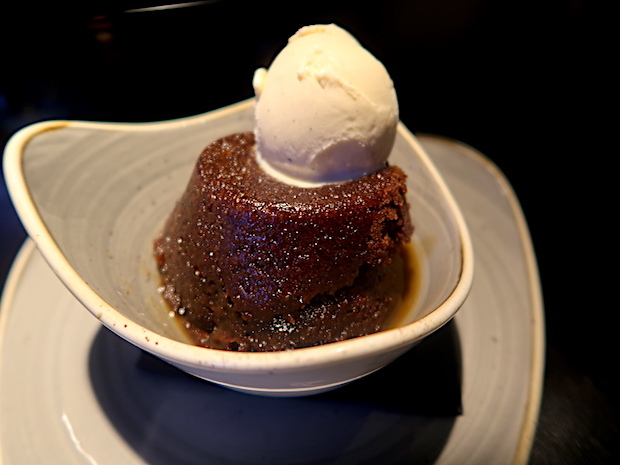 Keeping in line with serving humongous portions, Red Iron’s toffee pudding was huge! The cake was soft and airy, and served piping hot with a creamy vanilla bean ice-cream melting spectacularly on top. It was definitely stodgy, but a classic dessert that reminds you of home. 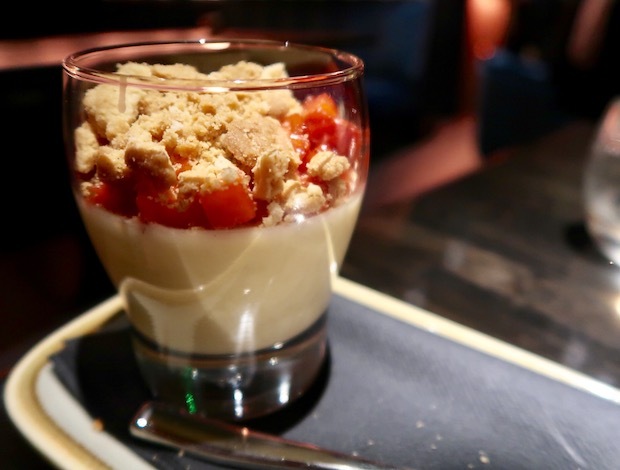 A creamy lemon pudding that had been topped with a strawberry puree, strawberries, and crushed biscuits. The cream itself was lovely and velvety, with a good zing of lemon, and contrasted well with the juicy strawberries and buttery biscuit crumble on top. A light and refreshing way to finish an especially heavy and rich meal. Wow, that was a lot of food! 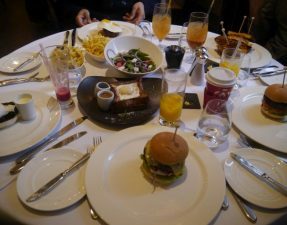 The total bill amounted to £200 for four, excluding drinks and service, so approximately £50 each. Sure, there were a few issues that do need addressing, but were not overly detrimental to our dining experience and I’ll put it down to teething issues of a new restaurant. 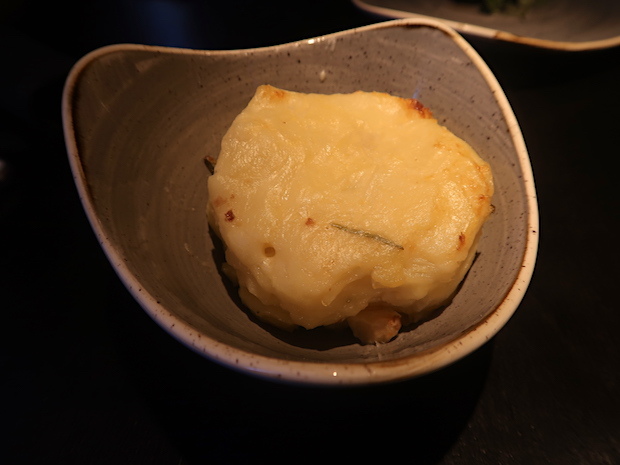 While there are some other limited options that do exist, Red Iron Steakhouse, in my opinion, offers something truly special in that it is not only a high-quality steak restaurant with an exceptional dining experience to match – but there is something for everyone and all very sensibly priced. I can’t wait to return. – Halal status on all meats verified by Muslim owner. – No pork or alcohol is served here. that is really sad. Looks like this place is out my long list of places to visit. I’m sorry you feel that way but my husband and I work really hard and often can’t afford to eat out at fancy places. When we do save up for a treat our experience is always ruined by kids on nearby tables screaming and yelling and their parents don’t care and don’t bother disciplining them. They’ve run up to our table and actually grabbed food from it before. This behaviour is sadly not the exception- it’s the norm. That’s not to say ALL children and parents are like that, but business is business. It’s up to the owners what kind of environment they would like to set and that’s fine by me! I far prefer a restaurant where I can actually enjoy my meal without it being ruined by screaming kids. If I’m going to pay upwards of £50 for a single course, then I want to enjoy it in peace. When I eat at Nandos, I expect to be besieged by children either screaming or running around – holding open the taps for the drinks machine or dripping frozen yoghurt on the floor, so there’s always a sticky mess everywhere. I do not expect this at a slightly higher end establishment. 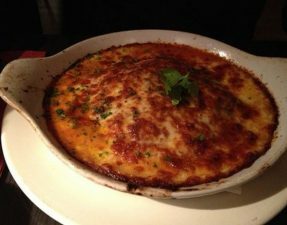 Red Iron is perhaps is the kind of place to visit when you leave the kids with grandma and have a date night? For family meals, there are plenty of child friendly establishments out there – believe me I know because I avoid plenty of them! Those who don’t have kids can enjoy a meal in a pleasant atmosphere in a nice place like this – well done Red Iron. ‘Besieged’ by children. LOL! Not sure where you’ve been eating. Not once in my life have I EVER been ‘besieged’ by children at Nando’s in the UK or abroad. Never had a problem with children making ‘sticky floors’ either.